Pinterest is my number one traffic source. And it’s one of the easiest ways to start getting traffic to your blog quickly. While you do you want to work on things like a SEO and I diversifying on where your traffic comes from, those things can take time. So starting with Pinterest and consistently pinning is a great way to get your blog up and running. Now it took me a long time to figure out the best way to continuously and consistently promote my website on Pinterest. It took some trial and error and it took wasting a lot of time doing little things that could be automated. 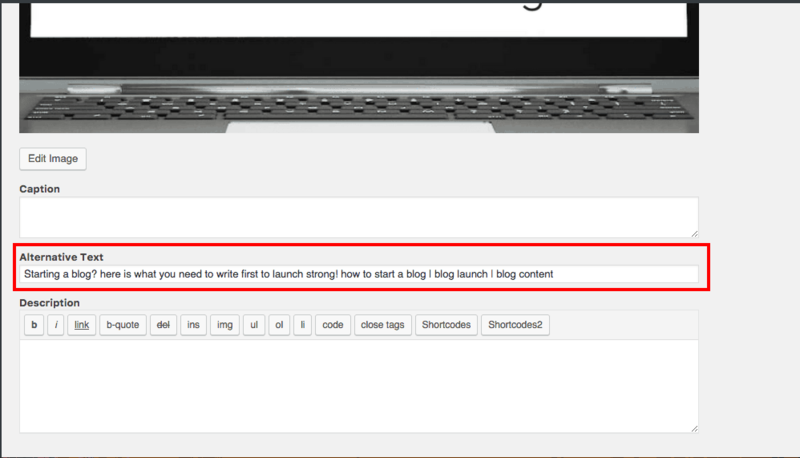 But I finally came up with a system that makes the most of my time and ensures regular promotion of my blog posts. So today, I’m going to share with you my Pinterest promotion strategy to help you promote your blog on Pinterest. Though I would like to note that I’m always looking for ways to improve, so it may change in the future. Should you pin manually every day? Or rely exclusively on schedulers? This is the debate that has been happening with a lot of bloggers. And while many would say manual pinning has great benefits, I just don’t have the time to manually pin everything. So what do I do? I do both manual pinning and Pinterest Schedulers. While most of my pinning is taken care of through automation with tools like Tailwind, I do try to go on the Pinterest every single day and manually pin a handful of pin for each of my sites. This means I am in fact, doing Pinterest stuff every single day. However I’m only spending maybe 15 minutes on it every single day. And then the days that I am working on building out my automation I spend a little more time, but generally speaking I’m not spending hours and hours every day. So every day I log in each of my Pinterest accounts because I have two website, I have two Pinterest accounts, and I will manually pin 5 to 10 pins to the appropriate boards. To save myself some time I have a catchall board for each of my Pinterest accounts. For Less Debt, More Wine, it’s a personal finance board and and for ElizabethStapleton.com it’s a self-employment and blogging catchall board. Being a part of group boards and Tailwind Tribes is a great way to promote your website to others and to get other people on Pinterest promoting for you. However, in order to remain in the group boards and tribes you need to be a good fellow pinner and follow the rules. Rules typically consist of how many pins you can add per day, the pin ratio you need to maintain, for example if you pin one of your pins, you then have to pin somebody else’s pin from the board. Rule may also include restrictions on whether or not you can include affiliate links or promote products. I’ll be honest making sure I stick to the rules is what takes up the most time when it comes to all the time I spend working on Pinterest promotion. Now, with Tailwind Tribes there is no easy way to really automate sharing from Tribes, as far as I know it must be done manually. So each week I spend a few hours scheduling from Tailwind Tribes to make sure I don’t have to worry about it when I’m submitting my pins to the Tribes throughout the week. Update, June 2018: BoardBooster went out of Business, as such this section is no longer applicable. Group Boards on the other hand are much easier to stay on top of and make sure you’re following the rules. Because you can automate it. Admittedly it’s not free but for the time it saves me, it’s well worth the $5 it costs me each month. BoardBooster plans start at just $5 a month so in my opinion it is well worth the more than 8 hours a month it saves me. For $5 I’m able to save an entire day and better use that time. I’m able to do this using BoardBooster’s Pin Sourcing Campaigns. BoardBooster also has several other things it does, but the only thing I use it for is Pin Sourcing Campaigns. A Pin Sourcing Campaign allows you to set up a certain board, so in this case, a group board and to have it automatically pull pins from that board and pin them to one of your boards. For example, I will have it pin to the max number of allowed pins each day from a Group Board to my catchall board. Ensuring I’m always sticking to the rules. I create different Pin Sourcing campaign for each group board, so that I can adjust them as need be if the rules change or if I decide to start pinning more or less. You then have to choose where the pins will go and this is where I select my catchall board. The next step is to include a link to the sourcing board, which is the group board URL. Just a note, you can only do the home URL of the group board, the URL for a specific section of the board will not work, I tried. You also have to select how many times a day to pin from the source board. You can do anything from 4 times a day to once every four days ,so just kind of depends on your pinning schedule, how often you’ll be pinning to the board, and what the rules are. Next is determining the requirements for the pins the campaign sources. I have it do tall only, and skip ecommerce, gifs, and videos. I also require that the pins the campaign sources have a minimum of 25 repins. Finally you hit start campaign and that’s all there is to it. It literally takes less than five minutes to set up but it saves me hours upon hours of time every single month. The more group boards I’m on the ​more time BoardBooster saves. So while BoardBooster takes care of pinning from group boards for me, I actually used Tailwind to schedule all my pins and to promote pins from my website. Again this is not a free tool but in the time it save me, and the access it gets me to Tailwind Tribes and promoting my sites that way it’s well worth the cost. If you use my link you can get your first month free so that you can test it out see if it’s really worth it for you. Tailwind allows me to easily promote my own pins by using board lists, the smart scheduler, and the Tailwind chrome extension. Many group boards will have the same rules. For example, a few different group boards will have a rule saying you can only pin three times a day and they may be niched down by topic as well. So I may be part of 4 group boards focused on debt with a limit of 3 pins a day. I can group these boards together in a board list in Tailwind. That way when I pin, I am able with one click have it scheduled to all of those boards in the board list at once. 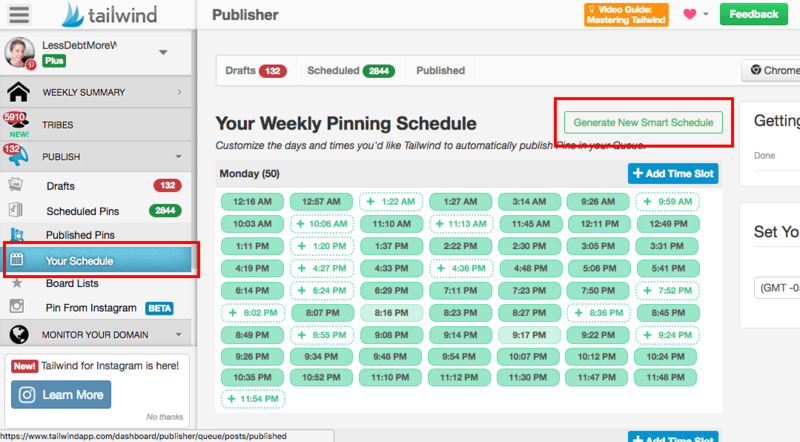 The smart scheduler in Tailwind figures out the best times a day to schedule your pins. Because let's be real, people are on Pinterest more during the weekend and in the evenings rather than at 6 a.m. Tailwind knows this and has figured out the best times to publish your pins. All you have to do you create your smart schedule is decide how many times you would like to plan a day. Usually 30 times a day if you have a smaller blog or 50 times a day if you’re trying to to push out a lot a concert to a lot of different group boards is a good place to start. Keep in mind it may not pin 50 total per day, it could be 45 one day and 55 another, it depends on when the best times to publish are, but it will average out to the number you decide. Tailwind figures it all out for you and once you smart schedule is set up, you don’t have to worry about it, it’s a one and done unless you decide to change the settings. Tailwind Tribes as I touched on earlier are kind of like group boards, they have rules and pinning ratios. However, they are a lot easier to find and request to be on. It’s also way easier to keep track of your pinning ratio. See with Tailwind Tribes you can search for tribes and then just click “request to join.” If you want you can include a quick note and then the owner of Tribe will receive a notice about your request. Sometimes you don’t even have to request, you can just automatically join, it depends on how the Tribe is set up. And because Tailwind keeps track of how many pins you’ve submitted and how many pins you’ve scheduled from the Tribe, it’s really easy to tell if you’re actually keeping up. Keep in mind it was easy for Tribe owners to see if you’re sticking to the rules or not. Ultimately, I really love the ease of use of Tailwind Tribes because you can search for the Tribes, making it easy to find and unlike group boards, easy to join. Now I should make note that the number of Tribes you can be a part of it is limited when you’re on the free Tribe plan. Because Tailwind Tribes is complementary to Tailwind Scheduling, you don’t have unlimited access. In order to get access to unlimited Tribes and submissions you have to pay for a power up plan. I’d recommend starting with the free Tribes plan of 10 Tribes and 80 submissions and then evaluate the value you get from Tribes before upgrading. OK now what I’m about to tell you is really the key ingredient to promoting my content. First, I have a board on my Pinterest profile that contains pins for every single post on my website. And whenever a new post goes up, I make sure to pit it to that board. I also have secret boards that match my board lists in Tailwind. I use the Best of Boards that contain all my content to copy content over to the appropriate secret boards. You can do this by going to the board and hitting “Organize”. You can then select pins and copy them to another board. When it comes time to actually schedule out my content I just have to go to the secret board and then using that Tailwind Chrome extension I select all of those pins to be scheduled and I select my board list that matches the secret board. To ensure I don’t pin more than is allowed I use the interval feature when scheduling pins. This means that if I have 4 group boards that allowed me to pin 3 times a day I will save interval for 3 pins and then 4 days after the start of the interval set the next 3 pins to start so that I’m only putting three pins a day to each of those group boards. I know it probably sounds a little bit complicated, but once set up it actually makes it way easier to ensure I’m promoting the absolute most I can to all of my group board and then I’m sticking to the rules. Once I schedule them all out I’ll make a note of how far out each board list schedule goes so that I know where to pick up when I schedule again. It actually speeds up the time it takes to schedule. In the past I would spend an entire day figuring out how to schedule my post to group boards into my own boards and now I get done in like an hour. All by just being consistent and adding my own pins to the appropriate “best of” and then the secret boards. Now pushing your pins to group boards or Tailwind Tribes isn’t the only way to get your pins found. Your pins and boards can also be found through searching and the best way to ensure your pins are found is by making sure you’re including a description on your pin and some keywords. You can pre-fill this description so that it’s included when others pin from your site by entering it in the Alt Text aka Alternate Text of your image. So what’s the best thing to put in that Alt text? A combination of a sentence and then some keywords you can utilize. I’ll be honest, I have been known to just keyword stuff my pin descriptions. While it has worked somewhat I think eventually Pinterest is going crack down on that practice, so it’s best to do a combination. You can also use a couple hashtags, just don’t go overboard with the hashtags. The other place to put some keywords in Pinterest is in your board descriptions. Having a solid description of your groupboard that includes keywords will increase your increase his chances of being found in Pinterest searches. 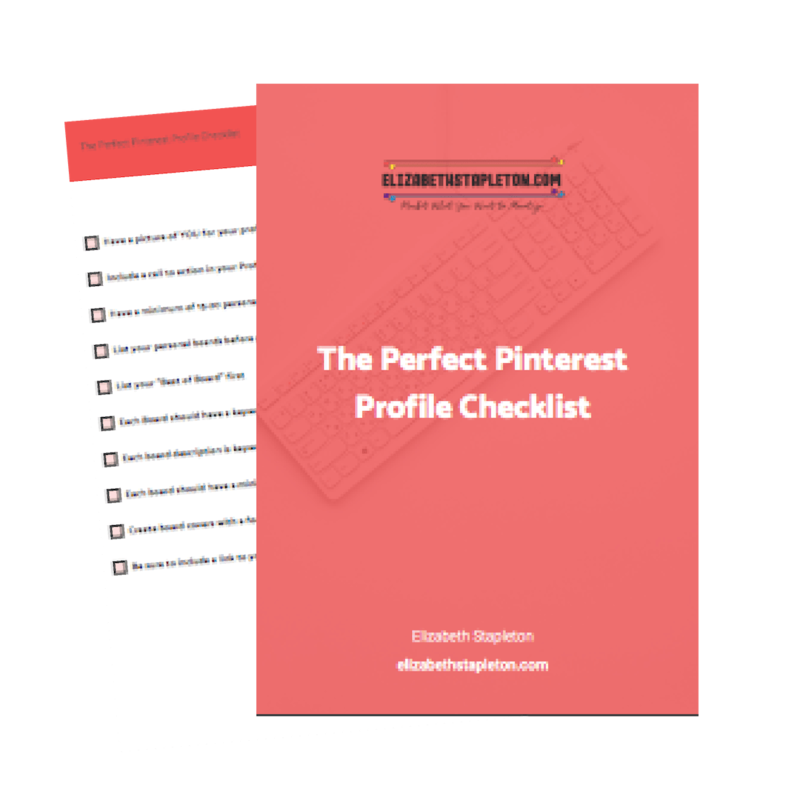 Pinterest is a great way to get your blog off the ground and attract readers but it does take some work. From finding and join group boards and Tailwind Tribes to actually promoting your posts within those group boards and Tailwind Tribes, making sure you obey the rules so you don’t get kicked out of those boards, it takes time and a strategy. Hopefully this post has helped you with your Pinterest strategy. If you’re looking for someone to just do it for you, check out my Pinterest VA Services.